A basic wall assembly consisting of 5/8" drywall screwed directly to the wall studs, and sound rated insulation filling the wall cavity provides the bare minimum in sound reduction. 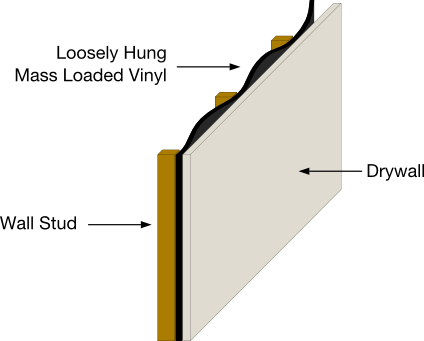 A layer of loosely hung mass loaded vinyl (MLV) adds a noticeable amount of sound reduction across the audible spectrum while only minimally increasing the wall thickness. Combining mass loaded vinyl (MLV) with a Green Glue based wall assembly provides the best results for sound reduction while using MLV. A Green Glue wall assembly will add extra performance in the mid and high frequency ranges. 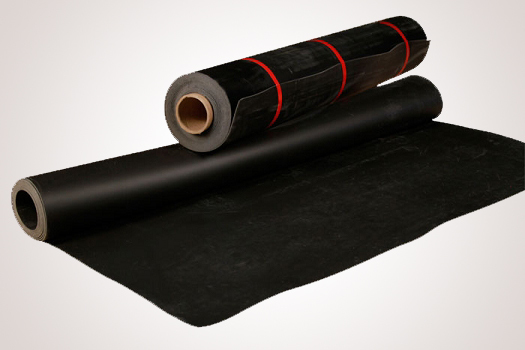 Mass Loaded Vinyl (MLV) is the traditional solution for sound proofing interiors easily and effectively. It packs a large amount of mass in a minimal amount of thickness. MLV is ideal for those who want to enjoy a quieter home and work environment in city dwellings, along with maintaining the space and dimension of rooms that are specifically desired to be sound proofed, such as media rooms, meeting rooms, and conference rooms.When sound waves hit loosely installed MLV, the energy in the sound waves is absorbed while moving the barrier, reducing the amount of energy remaining in the sound waves. In comparison to alternative sound proofing options, such as installing dry wall, MLV is a softer, thinner and more flexible material that is proven to diminish sound vibrations and noise. MLV comes in multiple weights and thicknesses that are ideal for blocking noises through wall and ceiling linings in any location. MLV is durable in that it will not rot or shrink, and is resistant to many environmental factors such as weak acids, oils, and alkalis; it is non-toxic. MLV is a flexible, 1/8" thick material that can bend and flex into many configurations, making it an extremely versatile solution. It's thin profile allows you to add soundproofing, while sacrificing only a minimum of space. 1lb/sqft. MLV boasts a STC of 26. The STC for the wall increases when drywall is taken into account. • Fasteners should be placed every 24 in. along studs and top and bottom plates. • All fasteners must use caps or fender washers. • Seams on studs should be covered with a layer of vinyl or foil seam tape. • Seams in stud cavities should overlap about 2" and be taped twice with vinyl or seam tape. • Installation requires 2 people for walls and 3 for ceilings. • MLV risks tearing under it's own weight if allowed to hang, secured only by a couple fasteners. Secure the beginning of the roll with at least 5 fasteners before allowing to hang. • MLV should be loosely hung so there is some slack. (The amount of slack in the image below and to the right is exaggerated for illustration purposes). • Make sure to leave a 1/4 in. gap around the perimeter of the wall to fill with acoustical caulk. Measure the length and width of the wall or ceiling where the MLV will be installed. Decide if your seams will be placed on the studs or if they will occur inside the joist cavaties, and adjust your measurements accordingly. Seams placed in joist cavities must be overlapped 2 in. Unroll the MLV and measure and mark the MLV corresponding to the wall or ceiling dimensions. Subtract 1/4 in. from the height of the walls to allow space for acoustic sealant. (For ceilings consider the height to be the dimension that runs parallel to the studs). Cut the MLV using a straight edge or T-square and a utility knife. Make sure to cut the pieces a little bit larger in the direction of the length of the wall so as to allow the MLV to have some slack when installed loosely. (For ceilings, consider the length to be the dimension that runs perpendicular to the studs). Fasten the MLV along the top plate with at least 5 fasteners (plus corresponding caps or washers - see installation notes on previous page). Be careful not to let the MLV tear under it's own weight. Continue fastening the MLV along the top plate placing fasteners every 24 in. Remember to leave a little slack in the MLV between studs.MLV is positioned straight. Fasten the MLV to the studs from top to bottom, every 24 in. Fasten the MLV to the bottom plate, leaving 24 in. between fasteners. With assistance from a 2nd and 3rd installer, place the MLV in one corner of the ceiling, and make sure the MLV is positioned straight. The MLV will be installed perpendicular to the ceiling joists. Fasten the MLV along one outer-most joist with at least 5 fasteners (plus corresponding caps or washers - see installation notes on previous page). Be careful not to let the MLV tear under it's own weight. Continue fastening the MLV along each joist placing fasteners every 24 in. Remember to leave a little slack in the MLV between joists. Adhere vinyl or foil tape along any seams between sheets of MLV. If the seams exist along joists, cover with one layer of tape. If the seams exist between studs, cover with at least two layers of seam tape. Make sure all fasteners are flush to the wall or ceiling. Cut holes in the MLV where necessary for light switches, electrical outlets, lighting fixtures, etc. Seal the gap around the perimeter of the MLV with acoustic sealant. 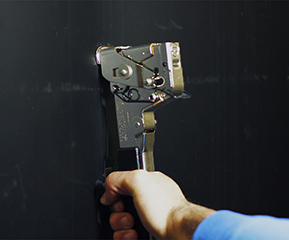 Lift drywall into place and fasten with appropriate dry wall screws. Tape and mud as needed. Make sure to Leave a 1/4" gap around the perimeter of the wall or ceiling, using shims at the bottom of the wall panels as needed. Fill the 1/4 in. gap around the perimeter with acoustic sealant.